Held the third Tuesday of every month, the after work networking series continues. Features a free wine giveaway. Presented by KMB Marketing. Free. 5-9 p.m. The Grape-SouthPark, 4300 Sharon Rd. www.kmbmarketingllc.com/. GPT says: It’s the only networking event in the SouthPark area. Signed by India.Arie, David will be performing songs from his recently released major label debut. $15. 8 p.m. Evening Muse, 3227 N. Davidson St., www.theeveningmuse.musictoday.com/. This edition of the city’s most popular Wednesday networking event is a party with a purpose. It will be spotlighting local groups that are making a difference such as the Urban League of Central Carolinas, Planned Parenthood Young Advocates, GenerationEngage, and the Arts & Science Council. And you'll learn how you can get involved. Music provided by Kitch and DJ Stacey Blackman. Sponsored by Creative Loafing and the Sol Kitchen. Free. 6 p.m. Loft 1523, 1523 Elizabeth Ave. www.thesoulmovement.com/. A networking mixer in the heart of the government district. And sure to be the delight of many, there’ll be a free gas card giveaway. Presented by IV Horseman Entertainment. Free. 6:30-9:30 p.m. KokoMo’s Coffeehouse, 901 E. Fourth St.
Come and enjoy a live band and spoken word by Concrete Generation. $10. 9 p.m. Wine Up, 3306 N. Davidson St.
GPT says: Wine Up is the home base for Charlotte’s flourishing spoken word and slam poetry scene. You’re guaranteed to enjoy it, so long as you’re not easily offended. Frankie, Neffe, and Keyshia Cole—this family puts the "real" in reality TV. 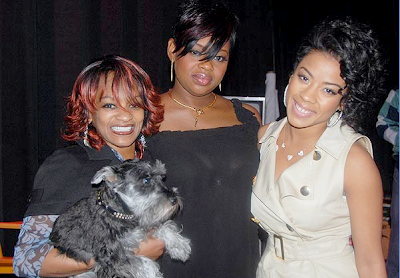 Keyshia Cole along with her sis Neffe and mom Frankie will be in the house and cameras will be rolling as they're filming for the third season of Keyshia Cole: The Way It Is on BET. Music by DJ Live. Presented by Mr. 305 Entertainment. Cost varies. Club Savoy, 3930 Brookshire Blvd. GPT says: Not sure why they chose Club Savoy of all places. They must want a ghetto-centric flair. See Shableek and Uncommon Jazz perform in a beautiful rooftop setting. Admission starts at $20. 6 p.m.-12 a.m. The Terrace, 201 S. Tryon St. (fifth floor above Harry and Jean’s). GPT says: This should be a great date night event—romantic even. Maybe this makes sushi more appetizing. It’s an exotic event in which sushi will be served on models' bodies. Music by DJ Silvio. Presented by LymeLight Entertainment. 9 p.m. $10 before midnight. Prevue, 2909 N. Davidson St.
GPT says: It’s naked sushi. Enough said. The series continues and this party features legendary DJ Spinderella (of Salt-N-Pepa). Hosted by Ifé Moore and Q92.7 will be broadcasting live. Cost varies. 9:30 p.m. Tempo Entertainment Complex, 4809 Wilkinson Blvd. GPT says: Tempo usually attracts a 30 and older crowd.